President Trump signed a sweeping executive order on Tuesday to begin the process of dismantling environmental regulations implemented under the Obama administration to aggressively fight climate change. 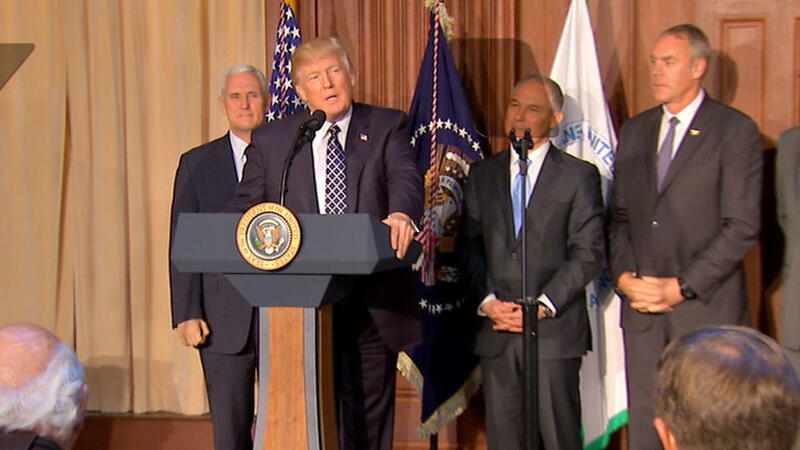 Mr. Trump hailed it as “the start of a new era in American energy production” in remarks before signing the Energy Independence executive order at the Environmental Protection Agency (EPA). His order aims to unwind the core of President Obama’s 2013 Climate Action Plan. The order “directs the EPA to suspend, revise, or rescind the Clean Power Plan.” The Clean Power Plan limits carbon emissions at coal-fired power plants. Mr. Trump’s executive order also lifts the moratorium on federal coal leasing, rescinds restrictions on hydraulic fracking, and eliminates the National Environmental Policy Act, a set of guidelines for agencies to consider climate change into their decision making process. “My administration is putting an end to the war on coal -- going to have clean coal, really clean coal,” Mr. Trump declared. The executive order also mandates that every agency conduct a 180-day review that identifies all regulations and rules that “impede” energy production. Mr. Trump plans to use the reports to craft his administration’s “America First” energy blueprint to serve what the administration calls the “twin goal” of protecting the environment and strengthening the economy by promoting energy production. Critics argue that Mr. Trump’s anti-climate change initiatives that resist transitioning from coal and gas to clean energy will in fact hurt the economy. During the Trump administration’s review of President Obama’s Clean Power Plan, the White House is also rolling back the federal regulation of methane emissions from the oil and gas industry. The senior White House official said that the president and the administration accept the scientific view of climate change but they disagree with the Obama administration over policy prescriptions. There is no mention of the Paris Agreement on climate change, from which Mr. Trump has previously said he would withdraw. Roughly 200 countries agreed to the climate plan that cuts greenhouse gases, but the senior administration official says that they have not made a final decision on the matter.